66% of small business owners say finding new customers is a top concern. You need a partner that can help put your best foot forward online and one that knows how to drive qualified leads into your pipeline. So you can make more sales and grow your business. Get a free strategy review! Visigility is a full service digital marketing and web design agency in Tulsa, Oklahoma. Growing your business is our passion. We help companies craft their online presence. …By delivering a unique recipe combining cutting-edge web design with result-driven SEO to generate leads and sales for our clients. 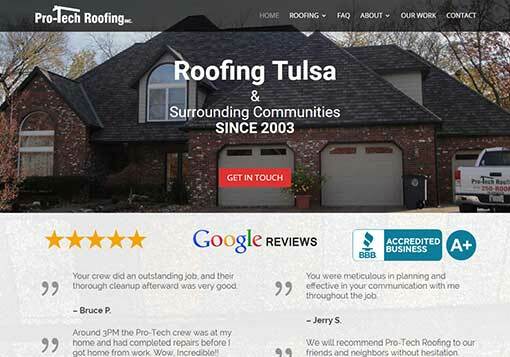 We serve growing companies in and around Tulsa with small business website design and Tulsa SEO. We also help national brands expand influence throughout the US and around the world. …a website designed to bring in leads and sales. Artful storytelling that utilizes page layouts, graphic design, written text and multimedia purposefully arranged to inform, inspire, entertain or encourage action on the part of your visitor. Work consisting of content creation and content optimization designed to increase the quantity and quality of traffic to your website through organic (free) search engine results. The marketing of products & services through electronic devices using various channels – including websites, e-mail, apps and social networks – to engage customers and grow business. These are important website factors to keep in mind for local SEO and for Tulsa SEO. Here’s a Google Analytics screenshot of organic website traffic for one of Visigility’s SEO clients. These numbers represent a year-over-year increase in organic traffic during a 2-month span July-Aug 2017 vs July-Aug 2016. 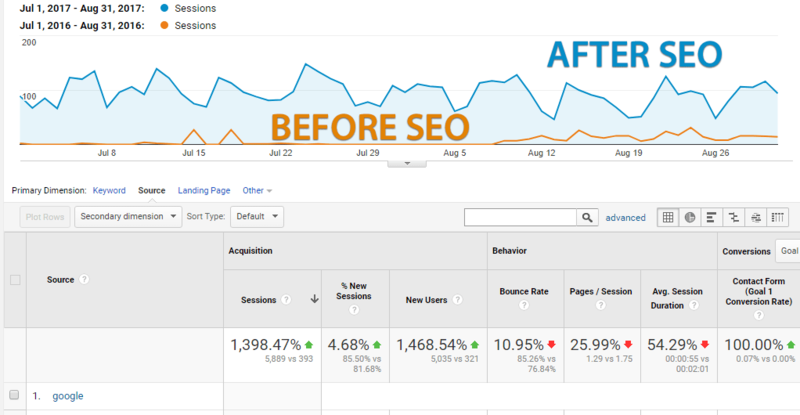 The organic traffic this client now gets would cost approximately $6,000 to $10,000 per month to generate the same traffic through Google AdWords or some other paid advertising channel. Sometimes Tulsa Search Engine Optimization takes time. Although SEO will generate some immediate increases in organic website traffic and keyword rankings in search results, monster gains can take several months to materialize. Content marketing and link-building take time, but the SEO investment can generate huge ROI (especially compared to PPC or display advertising). Does your website accurately represent the high quality of your goods or services? Are you (and your sales team) proud to show your website to prospects or vendors? Does your website rank on the 1st page of Google for at least 5 of your target keywords? Is your website generating plenty of traffic and leads for your business? 84% of the people we talk to answer NO to at least one question. If you answered YES to all of them – that’s great! If you think you need help in any of these areas, let’s visit. We will create a plan to get your web strategy firing on all cylinders. As a Tulsa business owner, you are responsible for running a smooth operation. And managing your cash flow in a prudent and responsible way. If you’ve ever received website design quotes from Tulsa web design companies in the past… Chances are. You were quoted web design prices ranging from 500-bucks to $15,000 (or more) for your new website. And most web design companies in Tulsa require payment in full upon completion of the website. For some business owners, coming up with thousands of dollars in 2-3 months is not feasible. We build your website today – and give you 12 months to pay. That’s easy on cash flow and helps your new website pay for itself a whole lot faster! Plus – with FREE hosting • FREE content updates • FREE SSL certificate • FREE support • And a lot of TLC – you have a true marketing partner on your side. Because just like you… We want to see your business grow.